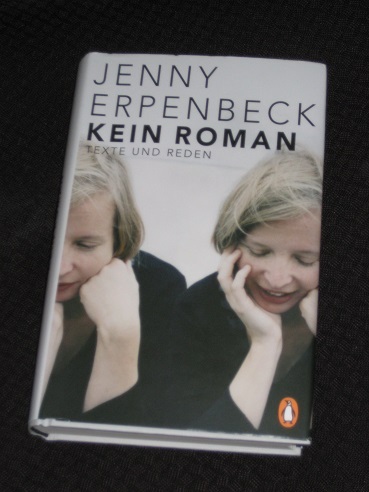 Kein Roman: Texte und Reden (Not a Novel: Texts and Speeches) does exactly what it says on the cover. Spanning more than 400 pages, the book brings together an eclectic variety of odds and ends from the past twenty years (with one piece dating back to 1992), separating them into thematically linked sections such as Life, Writing and Literature, and Society. As you might expect from this kind of book, there is a little repetition at times, with a few favourite anecdotes trotted out on several occasions, and some of the pieces are slightly less than enthralling. However, overall there’s a lot to like here. I was originally sent a digital version by Penguin Verlag (Germany), but I decided to splash out on the hardback, and I’m fairly happy with my decision. Die Freiheit war ja nicht geschenkt, sie hatte einen Preis, und der Preis war mein gesamtes bisheriges Leben. Der Preis war, dass, was sich eben noch Gegenwart gennant hatte, nun Vergangenheit hieß. Unser Alltag war kein Alltag mehr, sondern ein überstandenes Abenteur, unsere Sitten plötzlich eine Attraktion. Das Selbstverständliche hörte innerhalb weniger Wochen auf, das Selbstverständliche zu sein. Eine Tür, die sich nur alle hundert Jahre auftut, hatte sich aufgetan, aber nun waren auch die hundert Jahre für immer um. Meine Kindheit gehörte von nun an ins Museum. This freedom was not a gift, though, there was a price to pay, and that price was my whole life up to this point. The price was that what had previously gone under the name of the present was now called the past. Our everyday life was no longer everyday life, but an adventure we had survived, our customs had suddenly become a source of fascination. In the space of a few weeks, the self-evident ceased to be self-evident. A door that opened but once every hundred years had opened, yet those hundred years were now over forever. From now on, my childhood belonged in a museum. It makes for a timely reminder that reunification wasn’t all about ridding yourself of a miserable past. Memories play a major role in Erpenbeck’s work, and there are several pieces in the book, quite apart from the childhood reflections, where she returns to the theme. One of these is the earliest piece in the collection, an earnest university assignment on Wagner (if there’s one thing I learned from this book, it is Erpenbeck’s background in opera!). The writer’s examination of Siegfried’s ‘Gedächtnisverlust’ (memory loss) in the “Götterdämmerung” part of the Ring Cycle is the longest piece in the book. 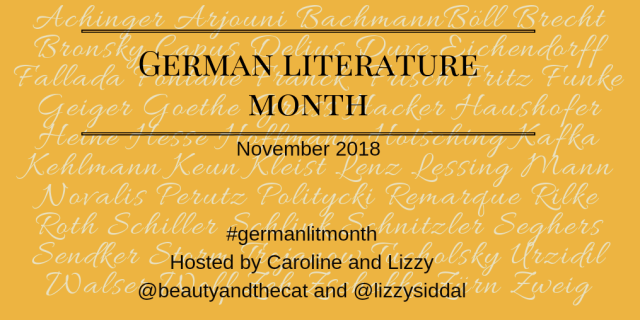 I have to say that I was a little lost by some of the musical terminology here (owing less to my weakness in German than to my complete lack of knowledge of music), but when the writer sticks to the literary side of the topic, it makes for a fascinating commentary on the theme of memory – and lack of it – running throughout the classic story. Noch nie habe ich einen Dankesrede gehalten, noch nie eine halten müssen – das liegt daran, dass dieser Solothurner Preis der erste Preis ist, wo ich, sozusagen,den Hauptgewinn bekomme. This is a rather modest, grateful approach from a writer who feels she’s finally arrived. Don’t worry, though – she’ll have *many* more opportunities to work on her speeches. You see, Germany has a plethora of literary prizes, and Erpenbeck seems to have won most of them, with a large number of her speeches (an integral part of the whole affair) collected here. Some are simply variations on a theme, standard thank-yous with little original content, while another common approach is to consider the writer the prize is named after and find common ground between their work and her own. In this way, we are treated to her thoughts on writers like Thomas Mann and Hans Fallada, but it’s the lesser-known writers Erpenbeck feels compelled to explore as a result of being awarded their prize that often make for the most interesting reading. There is one other common thread, however, and that’s her genuine gratitude for the money attached to the prize, money that allows her to focus on her writing (serendipitously, I was reading this just as Anna Burns’ novel Milkman won the Man Booker prize…). The speeches included here are not just made on the occasion of picking up novelty cheques, though. At the heart of the book are the ‘Bamberger Vorlesungen’ (Bamberg Lectures), four speeches Erpenbeck gave over the course of a month back in 2013. Coming in at well over a hundred pages in total, almost a book in their own right, they provide some fascinating insights into her work. The first explores The Old Child as an allegory of not being able to move on after the fall of the wall, while the second focuses on The Book of Words and a rather interesting moral dilemma: is it ‘better’ to murder the children of your enemies (as the Nazis did) or make them your own (as was the case in Argentina)? The third lecture then takes a look at Erpenbeck’s plays, with a particular focus on the importance of dialogue, and silence. However, it’s the final talk that is, perhaps, the most interesting. No prizes here for guessing that it’s on The End of Days, but you may be surprised to learn that the thirty-two pages are spent looking at just two sentences, and an afternoon the writer spent trying to improve them. Zwischen der ersten Hälfte meines Lebens, die durch den Fall der Mauer und den Zusammenbruch der DDR museumsreif wurde, und der zweiten, die damals begann, ist seither eine Grenze aus Zeit. Ohne die Erfahrung dieses Übergangs von einer Welt zu einer ganz anderen, so sehe ich das heute, hätte ich wahrscheinlich nie begonnen zu schreiben. Yes, it’s an old obsession, but we’re about to look at it from a brand-new angle. This is NOT a novel, OK? I’ve heard her talk about her life a little on a couple of occasions but I would love to read about it. I’d also be keen to read what she has to say about her novels. I suppose whether this will be translated will be dependent on just how well known she becomes! I was one of those annoying members of the younger generation dismissing Ostalgie – but as I grow older and see that the capitalist system isn’t all it’s cut out to be (in fact, the UK is starting to resemble more and more the propaganda image of the West that was shown to scare us off), I empathise more with that position.